With the Tom Clancy’s Humble Bundle going on as of now, many have asked me how’d you get the Xbox One controller to work with it correctly cause if you haven’t already tried. Buttons are swapped and right analog stick doesn't work, etc.. Well, you’re in luck; I have a quick fix that sure will get you up and running Splinter Cell: Conviction(PC) with the Xbox One Controller in no time. Without further ado, lets dive into it. Xbox One controller obviously, or any third party controller that’s PC compatible cause this tutorial will fix those too. Splinter Conviction with all of its patches installed. UPDATE-02/05/2019: The current build of X360ce(3.2.10.82) apparently may not be working properly. If you get to the point where “Default Settings for Most Popular Controllers” tab is blank and/or still experiencing unusual controller behaviors. You'll have to use an earlier build of X360ce(version 3.2.8.76 to be exact). I've uploaded a copy of X360ce 3.2.8.76 to DropBox Cheers!! Once you have everything downloaded and ready to go. The first thing you want to do is extract X360ce.zip. Once extracted, what you want to do is move the X360ce.exe to your Splinter Cell: Conviction game directory where the games exe is located. The games exe should be located within the src\system\ directory. If you see Conviction_game or Conviction_game.exe, you're in the correct directory. If you don’t know where your game is installed, just head over to your UPlay and open Splinter cell Conviction extended menu and head over to game properties then Local Files the directory will be shown there. Simply hit the Open Folder button and you shall be taken there. 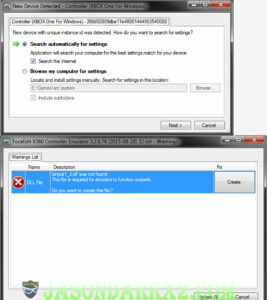 Once copied over simply right click on x360ce.exe and run it as administrator. Allow it to search Automatically for settings, when it asks if you want to create a Xinput1_3.dll file simply hit the Create Button, if there’s an exception error message just hit continue. Now you to have to close X360ce.exe and run it again as administrator. 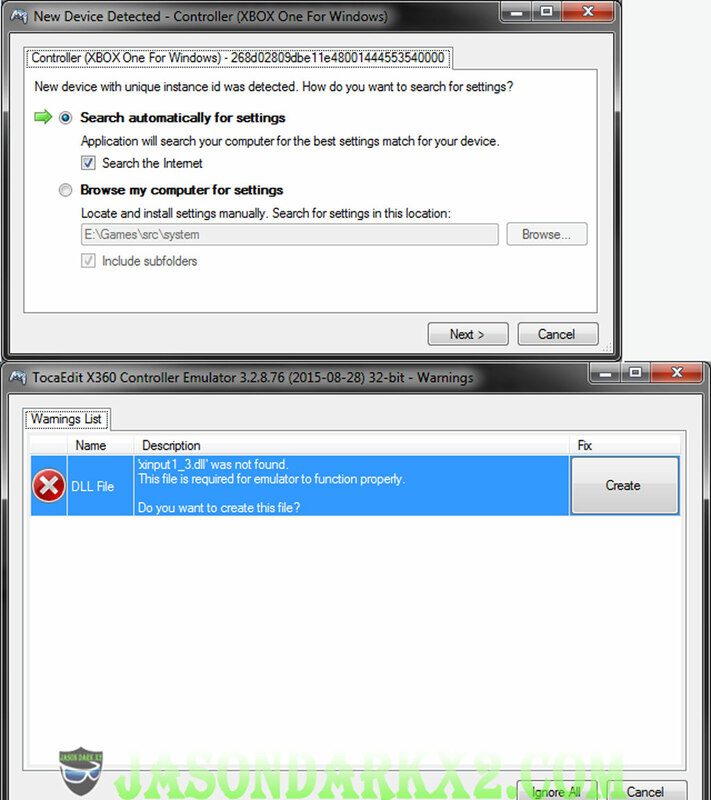 Now hit the controller one tab you should see an Xbox 360 controller, verify that your controller is working properly by hitting/clicking buttons and a green dot will light up on the image corresponding to which button you clicked. Once verified working head over to the Controller Settings tab, you should notice that your controller/Device is selected on the top left corner and the Program/Game exe on its right. Now what you want to do is head over to “Default Settings for Most Popular Controllers” tab and pick Controller (Xbox 360 wireless receiver for Windows) from the list. Then hit Load ,afterwards hit Yes when it asks "load Preset Setting?" Once successfully saved, delete the x360ce.exe boot game and enjoy Splinter Cell Conviction with your Xbox One Controller (^.^) hope this help anyone having trouble playing Splinter Cell Conviction with the Xbox One Controller or any other controller. If you have questions, feel free to leave it in the comments sections. Followed this tutorial, and I got it to work like a Charm on my Windows 10 tablet with Xbox One Bluetooth Controller. Saved me the hassle of going through a Steam refund. Super Thanks! My Uplay doesn’t have the “Show local files” button. Any help on where those files might normally be located? If you’ve used the default install directory it would be under C:\Program Files (x86)\Ubisoft\Ubisoft Game Launcher\games\ look for the splinter cell conviction game directory there if you have more than one uplay game installed or still having trouble finding it try searching for conviction_game in search system bar, it would bring up the game executable, then right click on it select open file location, bringing you to its location. This single tutorial posts is better than the entire Ubisoft forum and technical support team who had no idea what I was talking about. Thanks Jason! There should be a link to this fix tutorial in the Humble Store and Steam Store for SC: Conviction. This Saved me hours worth of digging around Google for a fix. Found this tutorial through Twitter and Following it got me up and running in less than 5 minutes. Thanks Jason! It worked, Your a life saver! I got this game from Humble Bundle and been trying to figure out xbox one controller issues for days now. Super Thanks for posting this tut Jason!